There are many options when buying one of our camping yurts. We realize that most of our customers have different requirements, so we try to cater to everyone by offering many options and selling yurts at all stages of completion. Many people just want to buy the yurt and get out there and camp. Others like to save a little by buying a kit, and some prefer to do a little woodwork and build the yurt themselves. If you have any special requirements or ideas, we make custom yurts too. Ready to Go – Complete and ready to go camping. Full Yurt Kit – We supply all the parts and you finish tying two wall sections. 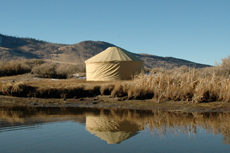 Basic Yurt Kit – We supply the hard to make parts and you make the rest. 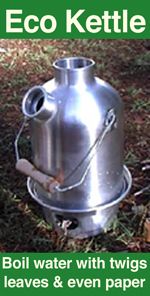 Yurt Parts – Pick and choose the parts you need. All our camping yurts are hand crafted in Summer Lake, Oregon, USA. The roof poles and wall lattice are made using Douglas Fir as it is strong, durable and coated with boiled Linseed oil. An alternative to Fir is Cedar which is one of the strongest woods for it’s weight, so if it’s a lightweight yurt you are after, Cedar is a good choice, but is does bruise more easily and can splinter as it ages. We also offer Cherry as an attractive alternative hard wood, but hardwoods are much heavier. We can make yurts with pretty much and wood specie so let us know if you have something special in mind. 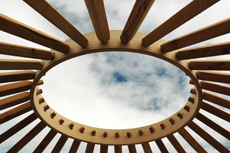 The roof ring can also be made with different wood species. The standard ring is made with Ponderosa, but we also offer ‘tight grain’ Doug Fir, Red Oak, Cherry, and Mahogany. All wood except the roof ring and door frame are sealed with oil to preserve and enhance the grain’s natural beauty. The roof ring and door frame are coated with several protective layers of Spar Varnish to seal out moisture. 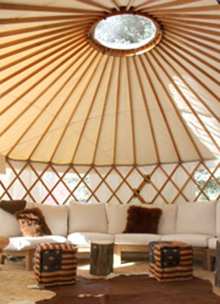 A cared for yurt will last a lifetime. If you want unfinished wood to paint the parts, please let us know when ordering. We use white untreated 10oz cotton canvas for indoor yurts or those that WILL NOT get wet. Untreated canvas will shrink if it gets wet. We recommend the treated “Sunforger Marine Canvas” for outdoor use. We can also provide a heavier duty Sunforger Canvas in 12oz. This canvas will last longer and is a good option on the roof as its takes most of the UV rays. We can provide different colors for indoor office yurts, but sadly getting treated colored canvas can be very expensive – let us know if you have interest in colored canvas and we will see what we can do. Although colored yurts are great, we don’t recommend them due to the colors absorbing the sun’s heat which significantly heats up the yurt. White canvas reflects most of the heat and allows more light penetration inside the yurt. If you have a custom design or require some special options , please contact us.